For this method, I have chosen to find the root between 0 and 1. Below is the process taken to find this root, each table represents zooming in once (halving the window e.g. first window is 1 unit, second window is 0.5 units). Shown in the lightly shaded area; are the X values for which the first 3 decimal places are the same. From the image above it can be seen that the process has succeeded in finding the root, although on the diagram it appears that the line is cutting at 0.143, it does indeed cut just before, however due to the limitations of the software, it cannot zoom in anymore to show properly labelled numbers. 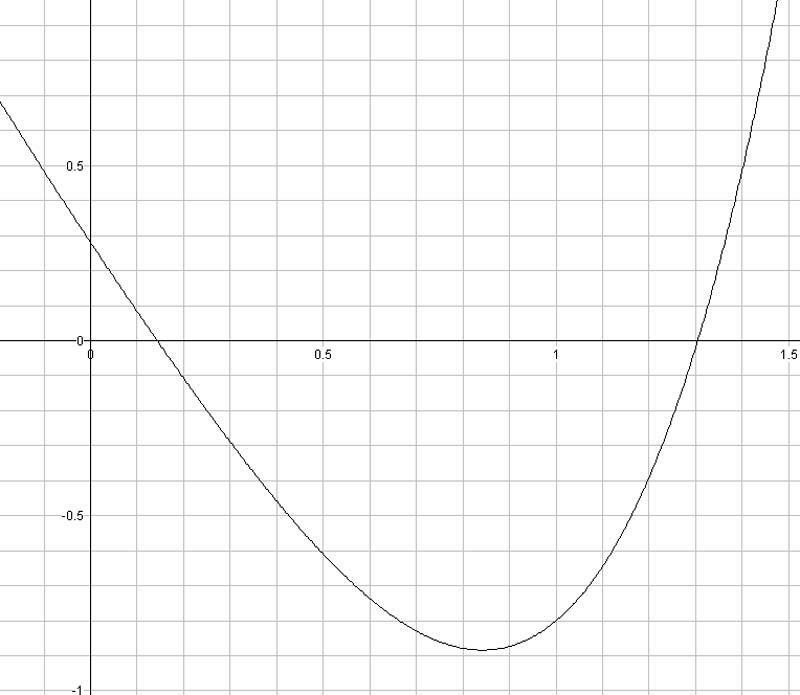 Looking at the gradients at the integer values of X it can be seen that zooming into the root close to x = -1 will be possible, however looking at the gradient at X = 0, it does not seem steep enough for it to find the root closer to 0. We can see below that it does not. As seen in the diagram above, the iterative process used to solve the root failed as instead of finding the desired root, it zoomed in on another, thus resulting in a failure. 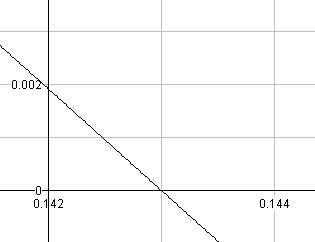 The error bound for the demonstrated point of success is ±0.000002. 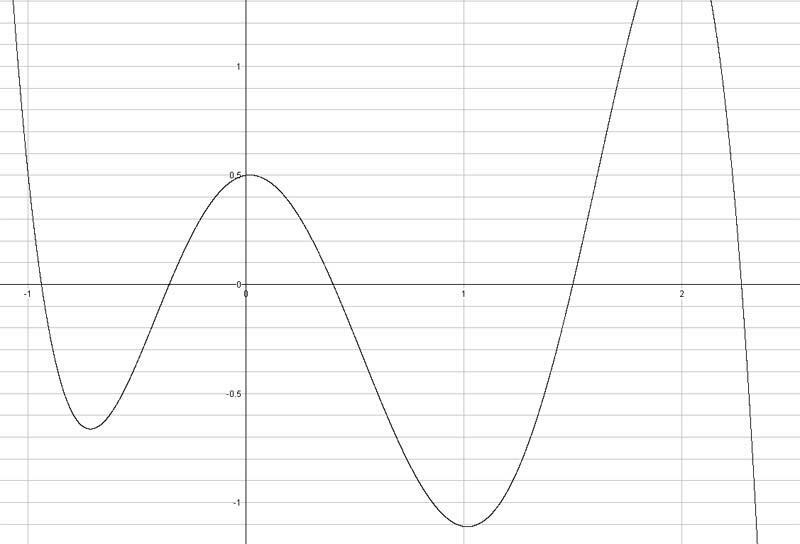 This was calculated by subtracting the mean of the last two different values of Xn+1 from those values. From previous knowledge, we know that if two functions were rearranged into one, the points of intersection will be the roots to the singular (rearranged) equation. Excel was used to solve the function as this software makes iterative process very easy by using its auto-fill function (which looks at the pattern within the selected area, then repeats it throughout the dragged region). This function was used repeatedly throughout all methods, however, was easier to implement in some methods (details of which are mentioned below). The bisection method was very easily achieved in Omnigraph as it only need meet one requirement, that the successful root intersects the X axis between 2 integers where there isn’t another intersect. However, using Excel to solve the root was more difficult, as each step involved its own table, which had to be copied and pasted for each step. Then the figures of the previous step had to be entered also, resulting in a long and repetitive process, with a relatively inaccurate result. 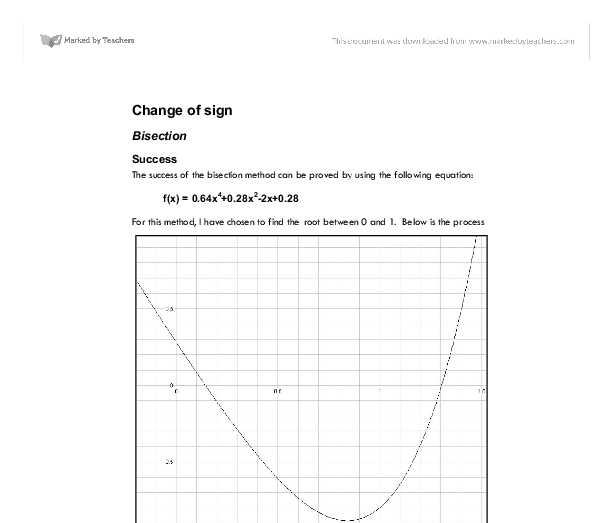 The Newton Raphson method was completed with much more ease, as after the differentiation of the function, the rest becomes easy as the equation is to be inserted into the top cell, then auto-filled until the sequence converges (or diverges). Also this method would be much easier to achieve much higher levels of accuracy, as each line of the table is one step and a subsequent increase in accuracy. The rearrangement method may be the easiest of the methods to implement as all that is needed is for the g(x) to be placed into the cell, and the cells dragged down until the sequence converges (or diverges). Again like in the Newton Raphson method, each line of the table represents one step. So the more that is auto-filled, the more accurate the root is. became bigger and the scale in Figure1 (b) followed the same. However, a fundamental assumption behind OLS is that the behavior of the residuals is random. The Figure 1(b) shows that the residuals are related to one another, therefore the absolute consumption equation not fits data well as the graph is pattern. value of "b" is the horizontal stretch factor of the graph along the x-axis. The stretch factor is used as 1/b. The new period can be calculated from 2pi/b. * The phase shift represented by "c". Varying values of "c" tell how much each cycle shifts along the x-axis. Entry is $100 a ticket, and there is a set limit of 222 000 tickets sold. For the purposes of the calculations, all of the prizes from $1 000 000 to $22 207 shall be ignored. This is because the Payoff and the Odds are quite incongruous throughout these prizes. �)] = -1.380277569 x8 = x7 - [(x7 ^4+x7 �-1=0)/( 4x7 �+3x7 �)] = -1.380277569 I can see some convergence from x6. There has been no change in the x-values between x7 and x8 for this number of decimal place. In order to create the SierpiÅksi Triangle, we need to set variables. 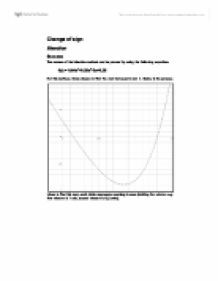 Variable A and B both mean to go forward, variable + means to turn left by an angle of sixty degrees, while variable – means to turn right by sixty degrees.